Supermarket Chains such as Wegmans are trying to make it easier for consumers to locate store brand products within their stores that are gluten free and are doing so often by using a nutrition key (related to the concepts of Nutrition Keys we wrote about at the end of last year in our two part article series “Healthy Eating Need Not Be Just A Fairy Tale”on 30Dec2011 and 31Dec2011). That blog series focused on nutrition labeling on the Front of Packages (FOP) at the Point-of-Purchase (POP). This Spring of 2012 expect to see an expanded marketing effort for the renamed national Nutrition Keys program (now being called Facts Up Front). MarketResearch.com released a report last Feb. 1, 2011 entitled “Gluten-Free Foods and Beverages in the U.S., 3rd Edition” noting that it is estimated that the U.S. market for gluten-free food and beverage items is expected to surpass 5 Billion by the year 2015. It was at around 2.6 Billion in 2010 for a compounded annual growth rate of 30% over the period of 2006-2010 in the U.S, although growth rates are expected to slow a bit as we head towards 2015. This blog will mention some apps that might be useful and the link to find more details of the ratings of some of them should you desire to see another RD’s review of these done for the Academy of Nutrition and Dietetics. First, a few other quick update details including one for professionals and two others for everyone. •For Professionals: there is an upcoming free webinar “Food as Medicine for Celiac Disease: Nutrition Beyond the Gluten-Free Diet” that some of you interested in Gluten-Free eating might want to be aware of. It is being offered at no charge courtesy of CeliacCentral.org and being sponsored by Blue Diamond and Cabot Cheese. The webinar will feature Rachel Begun, MS, RD, also known as The Gluten Free RD and one of the National Foundation for Celiac Awareness (NFCA’s) “Ask the Dietitian” bloggers, as well as a member of the NFCA’s Scientific/Medical Advisory Board. Rachel will explore the concept of using “Food as Medicine” in the management of celiac disease and also gluten sensitivity. The webinar will help bring to light the important role of nutrition in preventing, treating and even reversing illness. If you are interested, the date is Jan 25, 2012 at 8:30 PM ET/5:30 PM PT. Go here to register for this webinar. •Nuts.com (formerly Nuts Online) has a Guide to (their suggested) Gluten-Free Flour Blends that I saw posted at Pinterest by Jessica Calenae Hester. Jessica has a nice Pinterest Board with sub-boards and any of you with Gluten-Free interests might want to check out her “Gluten-Free-Goodness” Pin Board on the Pinterest site. •Also note that there are now some 8 Gluten-Free mix options available from King Arthur Flour which include a Bread Mix, Brownie Mix, Chocolate Cake Mix, Cookies Mix, Multi-Purpose Flour Mix, Muffin Mix, Pancake Mix and Pizza Crust Mix. 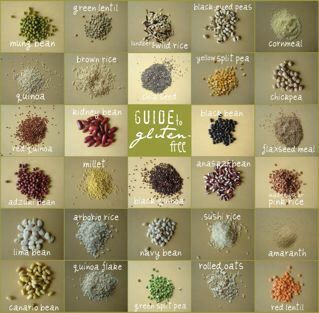 •Cara Reed over at Fork and Beans previously put together a nice visual guide called a “Guide to Gluten-Free” and with her permission, we’re sharing a small version here. Feel free to go to her blog site to see the full size image. It includes some of her favorite grains, lentils, beans and rices that she uses in her gluten-free living. We just thought that it might be inspirational to someone more recently diagnosed and needing to go gluten-free. Now about those apps addressing gluten-free living. Apps continue to be released and trying to keep up with the latest releases and also reading reviews that evaluate their respective quality as compared to a reasonable standard that works with a range of food and nutrition goals can take some time, but in the end, your health is worth it! Some of the apps that received good reviews in 2011 from a range of consumers and professionals include some of the following. This list is a smattering of what is available and is not meant to be a comprehensive list by any means whatsoever. Any errors, inaccuracies, or omissions are purely unintentional and we will gladly correct them if they are brought to our attention. Information listed was obtained as of the date the blog post was compiled and information on apps is always subject to change including current price point(s) and version release(s). Please remember that this blog site only provides infotainment and we do not endorse any specific app mentioned here per se, so we leave it up to you, the reader, to decide what makes sense for you in light of your own personal food and nutrition goals. If you have other health & medical considerations beyond addressing gluten-free living, those should also be taken into account. Please get medical advice from your medical provider. The Academy of Nutrition and Dietetics (of which one of us is a current member) released in December 2011 a review of a number of apps on the subject of Gluten-Free, so we are including a quick listing of those ranked by order of how many stars each was rated. We’ll also mention some other apps we have found on the www that are NOT rated on behalf of the Academy of Nutrition and Dietetics. Please note that just because one other RD gave an app a specific score does not mean all other RDs would give that same app that same score. Different strokes for different folks! Consider what works for YOU and make that your bottom line for any decision! If you are working with a RD, be sure to discuss specifics with her or him since as part of your health care team, the RD can contribute specific expertise, which when it comes to gluten free living can be invaluable. Gluten Free Daily free version 1.0 by Visual Identity Group, Inc. for iPhone, iPod touch and iPad. Requires a free membership account from GlutenFreeDaily which is an online guide website focused on promoting optimum health and is nutrition-based on a gluten-free lifestyle. Eating Out G-Free free version 1.0 by Hachette Book Group, Inc. for the iPhone, iPod touch and the iPad. Gluten Freed-Gluten Free Dining for Health and Celiac version 8.0 by Magnolia Labs, Inc. compatible with the iPhone, iPod touch and iPad is a gluten-free restaurant finder. AllergyEatsMobile free version 1.0.3 by AllergyEats LLC which also has a blog site. CeliacFeed – Gluten Free Locator free version 2.0.4 by Daljit Ghag is compatible with iPhone, iPod touch and iPad and is designed to help people discover and locate gluten-free restaurants and products (more details at the website). Food Additive 2: Free + by IGRASS PTY LTD this free version 2.0.1 is compatible with iPhone, iPod touch and iPad. Gluten Free Restaurant Cards from CeliacTravel.com version 1.5 by Pepper Stuff seller Doron Kramarczyk is compatible with iPhone, iPod touch and iPad. Restaurant cards can be viewed in multiple languages including (but not limited to) Bahasa Indonesian, Cantonese, Catalan, English, Italian, Japanese, Korean, Latvian, Lithuanian, Maltese, Mandarin, Neapali, Norwegian, etc. GlutenFreeMe version 2 less than $10USD by Steve Welch is compatible with the iPhone, iPod touch and iPad. Utilizes the Celiac Sprue Association (CSA) developed Gluten-Free Product Listing thus features over “20,000 CSA reviewed products from over 700 companies based on the 15th Edition, 2011 release from CSA.” It states it is fully authorized by the CSA. iGlutenfree free version 1.2 by i3GSoftware, Inc. sold by Daniel McGuire which is a regional app is compatible with iPhone, iPod touch and iPad and provides information on restaurants and stores that offer gluten-free options on Chicago’s North Shore. You may be familiar with another app that is not on this list, but which you happen to like and use. Although no advertising of an app would be appropriate, do feel free to post a mention of an app you have found helpful in your efforts toward reaching your own personal food and nutrition goals, and even your fitness goals, as others might be interested in checking it out as well. Once again, here’s to a Happy and Healthy New Year 2012 for you and yours!